For chef Tim Love, the perfect hangover cure involves a set of five beverages and a BLT. But hot, cheesy sandwiches can also do the trick. From super-fast melts to decadent ham and cheese sandwiches, here are nine amazing melty sandwiches to help with hangover recovery. Small chunks of milky, freshly made cheese are delicious in this savory sandwich. Ready in just 12 minutes, these fantastic open-face sandwiches get a spicy kick, thanks to jalapeño and Sriracha. 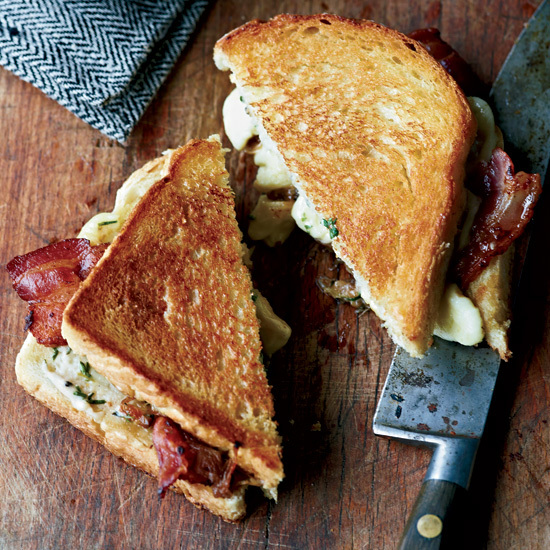 This comforting sandwich combines fresh mozzarella, Fontina, Gorgonzola and provolone cheese. Juicy plum tomatoes are layered between provolone and Fontina cheese for this decadent, melty sandwich. Smoky, salty ham pairs well with sweet, nutty Gruyère cheese. This over-the-top version of eggs Benedict features scrambled eggs with anything and everything. Olive tapenade, mildly tangy Mahón cheese and slices of Serrano ham make this the ultimate ham and cheese sandwich. “The best grilled cheese is the gooiest grilled cheese,” says Laura Werlin of this incredible version made with andouille sausages and Monterey Jack cheese. These pan-fried ham and cheese sandwiches are irresistibly cheesy and crisp.